Potassium is an essential mineral. It enables proper functioning of the nerves and thus sensations and muscle and heart contractions. It also helps to produce energy from carbohydrates. The Latin name for potassium is the same as for alkali — kalium. The chemical symbol for potassium is K.
Recommended Dietary Allowance (RDA) for potassium has not been set yet due to lack of scientific evidence. Adequate intake (AI) for potassium for adults–the intake probably sufficient for most healthy adults–has been set at 4.7 g/day. In some studies, this or higher intakes were associated with a lower risk of blood pressure and kidney stones [1,4]. Chart 1 source: Institute of Medicine (IOM) in the U.S.  *Breast milk of healthy mothers should provide enough potassium for exclusively breastfed infants 0-6 months of age [4,5]. The major potassium sources are fruits and vegetables. Common foods rich in potassium include potatoes, kiwifruits, avocados, bananas, green leafy vegetables, beans, beef, pork, fish, milk and “low-sodium” products. Chart 2. source: U.S. Department of Agriculture (USDA.gov)  NOTE: All foods listed are ready to eat. Potassium chloride is often used as a sodium-free substitute for table salt. It is also used in “low-sodium” and “no sodium” foods, as a food additive in commercial foods and as a potassium supplement. 1 gram of potassium chloride contains about 500 mg (0.5 g) of potassium. Taking potassium chloride instead of table salt to increase potassium and decrease sodium intake is generally not recommended; you should rather limit sodium intake and eat foods high in potassium. Can potassium chloride be dangerous? Large amounts of potassium chloride can cause stomach or intestinal ulcers and bleeding; taking more than 10 grams (2 teaspoons) at once can cause hyperkalemia [1,24]. From the ingested potassium, about 90% is absorbed, mainly in the small intestine. Most of the excessive potassium is excreted through the urine and only small amounts via feces and sweat [24,32]. In one 2012 systematic review of studies by World Health Organization (WHO) in individuals with high blood pressure high potassium intake (3.5-4.7 g/day) was associated with lower systolic blood pressure (by 7 mm Hg in average) than in individuals with low potassium intake (<3.5 g/day) . In few small studies, taking potassium supplements was not associated with decreased blood pressure but more research is warranted . Most researchers currently recommend consuming foods high in potassium, but not potassium supplements, to prevent high blood pressure [16,28]. In the same review by WHO as above, high potassium intake was associated with 24% lower risk of stroke . In some other studies, high potassium intake was associated with significantly lower stroke risk only in men, especially in those with hypertension, and in one study only in black men . In some, but not all, studies, higher potassium intake was associated with higher bone mineral density . In several studies, high potassium intake was associated with decreased risk of calcium kidney stones but more research is warranted [1,13,14]. A low sodium/potassium ratio in the diet may be more beneficial than a high potassium intake alone [35-p.222,230]. This means low sodium intake (a common recommendation is less than 2.3 g/day) and potassium intake higher than sodium intake (even if less than 4.7 g/day) may be more beneficial for blood pressure and kidney stones than consuming 4.7 g of potassium along with more than 4.7 g of sodium. More research is warranted. Dietary Approaches to Stop Hypertension (DASH) is an eating plan that recommends consuming foods high in potassium, calcium, magnesium, fiber and protein, and low in sodium, saturated and trans fats. According to National Heart, Lung and Blood Institute in the U.S., the DASH diet can lower high blood pressure and reduce the risk of cardiovascular disease, but it is not clear which exact nutrient, if any, is responsible for this effect . In the abovementioned review performed by researchers from WHO, high potassium intake was not associated with decreased risk of coronary heart disease . Can high-potassium diet be bad for you? The Tolerable Upper Intake Level (UL) for potassium–the maximal amount unlikely to cause side effects in healthy people–has not been set, because no adverse effects from high dietary potassium intake have not been reported . Individuals with chronic kidney disease, Addison’s disease and those who take potassium-sparing diuretics (amiloride, spironolactone, triamterene) may need to limit potassium intake, though. If you have a chronic kidney disease, especially if you are on hemodialysis, a doctor may prescribe you a low potassium diet with less than 1.5-2.7 grams of potassium per day, along with a low-phosphorus (800-1,000 mg/day) and low sodium (<2.4 g/day) diet . Peel vegetables, cut them to thin slices, put them into a large amount of water and bring the water to a boil. Discard the water and boil again in fresh water until cooked (double boiling). This way more potassium will leak into the water than with single boiling. Dry heating (baking, roasting, microwaving) and steaming (cooking in vapor) does not significantly reduce the amount of potassium in foods . Leaching for 2 hours or overnight in a large amount of warm water before cooking can also pull some potassium out of vegetables . Do not drink liquids from canned foods or cooked meat (beef soup). Avoid foods that list potassium additives on nutrition labels. Normal blood potassium levels range from 3.5 to 5.1 mmol/liter (the upper limit may differ from 5.0 to 5.5 among laboratories) . High blood potassium levels stimulate the adrenal gland to release the hormone aldosterone, which stimulates potassium excretion into the urine. A drop of blood pH (acidosis) stimulates potassium retention, and a raise of blood pH (alkalosis) stimulates its excretion into the urine. Potassium deficiency means decreased potassium body stores. Mild potassium deficiency does not cause hypokalemia but can result in water retention , increased blood pressure and increased risk of stroke, kidney stones and osteoporosis . Causes of potassium deficiency include decreased potassium intake, especially if accompanied with sodium intake greater than 7 g/day [35-p.191], diarrhea, excessive urination, kidney disease or excessive sweating during prolonged hard work in a hot environment for several days . Severe potassium deficiency results in hypokalemia, which means blood potassium levels lower than 3.5 mmol/liter. In healthy people who eat regularly, a diet low in potassium does not likely cause hypokalemia. What causes low blood potassium levels? Mild hypokalemia may present with no symptoms or with fatigue, muscle weakness and constipation. Severe hypokalemia can cause excessive urination (polyuria), numbness and tingling (paresthesia), muscle cramps, which can be painful (charley horse) or sustained (tetany), muscle paralysis, depression, pounding heart (palpitations) and irregular heart rhythm (arrhythmia), which can be fatal. Complications. Hypokalemia, especially in diabetics, may cause hyperglycemia. In some studies, both low potassium intake and hypokalemia were associated with increased risk of diabetes 2, but more research is warranted . Treatment of hypokalemia is by oral or intravenous potassium supplements. Potassium supplements are available only by prescription. In the U.S., potassium may be found in certain over-the-counter (OTC) multivitamin/mineral supplements but only in doses up to 99 mg per tablet, which is usually not enough to treat hypokalemia. Potassium chloride is available in the form of tablets, effervescent tablets or granules, capsules and liquids. Potassium liquid and powder for solution are intended for those who have problem with swallowing tablets. Potassium chloride extended release (KCl Er) tablets and capsules are slow-release supplements that were designed to minimize the risk of gastrointestinal damage. Wax matrix and microencapsulated formulations are available but the differences in their effectiveness are not yet clear . Enteric-coated (EC KCl) tablets are no longer commercially available in the U.S. because of possible severe gastrointestinal side effects. Alkalizing supplements–potassium bicarbonate, citrate and gluconate–are used to treat hypokalemia associated with acidosis (low blood pH) or to prevent calcium-oxalate kidney stones [25,30]. Magnesium potassium aspartate is used as a magnesium and potassium supplement. Potassium orotate has been occasionally used to treat anxiety . Potassium chelate is a general term for over-the-counter supplements in which potassium is bound to larger molecules, such as amino acids. One tablet usually contains 99 mg potassium. Potassium chloride, acetate or gluconate are used to treat severe hypokalemia [21,25]. The amount of potassium listed on the supplement packages is expressed either in milliequivalents (meq)–which is the same as millimoles (mmol)–or in milligrams (mg). To convert meq or mmol to mg, multiply meq or mmol by 39.1. The usual doses of oral supplements for adults are 15-30 meq (587-1,173 mg), 2 times per day or up to total 100 meq (3,900 mg) per day but it is your doctor who can prescribe the dose appropriate for you . Are potassium supplements good for you? POSSIBLY EFFECTIVE for prevention of kidney stones. In one study in y. 2009, potassium citrate supplements have been effective in prevention of kidney stones in children with epilepsy (seizures) on a ketogenic (low-carb, high-protein) diet . Potassium supplements are NOT EFFECTIVE for prevention of high blood pressure, neither alone or in combination with calcium or magnesium [9,10,16]. There is INSUFFICIENT EVIDENCE about potassium supplements effectiveness in prevention or treatment of acne, alcoholism, allergies, Alzheimer’s disease, bloating, blurred vision, cancer, chronic fatigue syndrome (CFS), colitis, constipation, dermatitis, fever, gout, headaches, heart attack, insomnia, infectious mononucleosis, insulin resistance, irritability, Menière’s disease (a type of dizziness), mood swings in menopause, muscle weakness, muscular dystrophy, myasthenia gravis, rheumatoid arthritis, stress, stroke and thallium poisoning . The percent of absorption and bioavailability of various potassium supplements is probably about the same . Potassium chloride is usually used to treat potassium deficiency, and alkaline supplements (potassium citrate, bicarbonate, gluconate or acetate) to treat acidosis (low blood pH) or to prevent kidney stones. Side effects of oral potassium supplements may include nausea, vomiting, abdominal discomfort, diarrhea and, rarely, intestinal ulcers with blood in the stool or even perforation of the intestine [16,24]. Intravenous potassium chloride can irritate the veins and cause local pain. According to the U.S. Food and Drug Administration (FDA), potassium is pregnancy category drug C, which means, harmful effects for the babies have not been confirmed but can not be excluded due to lack of human trials . According to Natural Medicines Comprehensive Database, potassium in doses up to 80 meq per day is likely safe to use during pregnancy and breastfeeding . 5.5 grams of potassium in a single dose can cause hyperkalemia and 18 grams or more can result in severe hyperkalemia, which may result in abnormal heart rhythm (arrhythmia), nervousness, confusion, lethargy, numbness and tingling in hands and around the lips, difficulty breathing, delirium, heart attack or even death [17,24,29]. Certain potassium supplements contain tartrazine, which can trigger allergic reaction in sensitive individuals . Who should avoid potassium supplements? Individuals who have hyperkalemia, kidney disease with potassium retention, Addison’s disease or those who take potassium-sparing diuretics should avoid potassium supplements. Anyone with swallowing problems or impaired intestinal motility should avoid solid potassium forms (tablets, capsules). Potassium phosphate is used as a phosphorus supplement. Acesulfame-K is a potassium containing non-caloric sweetener. Various potassium compounds are used as food additives. Potassium chloride pellets are used as water softeners. The potassium in water treated with softeners does not likely affect blood potassium levels in healthy individuals but can cause hyperkalemia in individuals with kidney disease or in those taking potassium-sparing diuretics (amiloride, spironolactone, triamterene). According to Health Canada, water with hardness 100 treated by potassium chloride can contain about 80 mg of potassium per liter and water with hardness 500 about 400 mg of potassium per liter . Hyperkalemia means blood potassium levels above 5.5 mmol/liter. 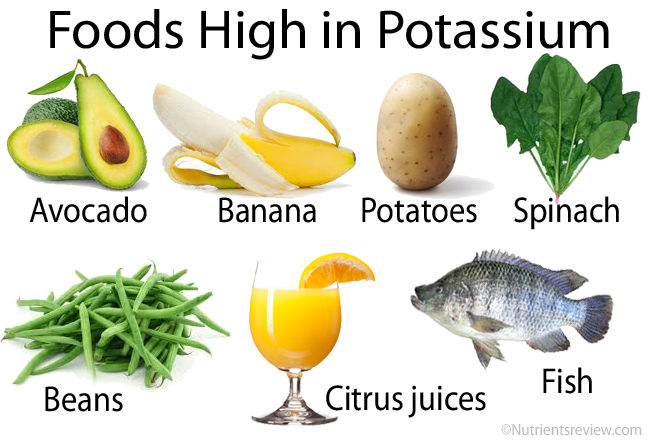 In healthy people, diet high in potassium does not likely cause hyperkalemia. Overdose of oral or intravenous potassium supplements. Ingestion of more than 5.5 grams potassium by a 70 kg man at once can cause measurable hyperkalemia and ingestion of 36 grams of potassium chloride (salt substitute) can cause severe hyperkalemia [1,2]. Mild hyperkalemia may cause no symptoms, but higher potassium levels can cause nausea, tingling, muscular weakness or paralysis, depression, abnormal heart rhythm or even death. Treatment of hyperkalemia may include an intravenous injection of insulin + glucose, or calcium gluconate (an antidote), and treatment of the underlying disorders. 1. Can you get too much potassium by eating bananas? Eating a lot of bananas or other high-potassium foods should not cause any potassium-related side effects in healthy people, but it could raise blood potassium levels in individuals with chronic kidney disease or in those taking certain diuretics (amiloride, spironolactone, triamterene). 2. Do I need potassium supplements if I am on a low-carb diet? Probably not. In the first days of a low-carb diet, about 500 grams of glycogen and about 9 grams of potassium bound to it is lost . You can simply replace this amount of potassium by eating potassium-rich foods. 3. Do I need to replace potassium during marathon running? No. In one small study, marathoners, after running 20 miles, did not have decreased blood potassium levels [35,p.226]. The potassium loss with sweat can be as high as 500 mg per liter of sweat, but can decrease considerably after several days of heat acclimation [35,p.226]. Runners can easily replace the lost potassium by eating common foods after the race, so they do not need potassium supplements or sport drinks during the race. 4. Do I need to follow a low-potassium diet if I have a sensitive bladder (interstitial cystitis)? Some doctors recommend avoiding high-potassium and acidic foods (tomatoes, citrus fruit juices, etc.) to individuals with interstitial cystitis, but not a low-potassium diet because of the risk of potassium deficiency . 5. Does hypokalemia cause eye twitching? Eyelid twitching might be a symptom of hypokalemia, but fatigue, stress and caffeine overdose are much more likely causes. 6. Is potassium a diuretic and can it be used to treat water retention? Potassium acts as a mild diuretic, but potassium supplements are not used to treat water retention. For individuals with mild congestive heart failure or other cause of water retention, doctors usually prescribe a high-potassium, low-sodium and fluid-restricted diet . For more severe water retention, doctors can prescribe diuretics along with potassium, but in this case, potassium is used to prevent hypokalemia caused by diuretics and not specifically to treat water retention. 7. Is potassium alkalizing or acidifying? Potassium naturally present in foods is usually in the form of potassium citrate, which alkalizes the urine, which may help prevent calcium-oxalate kidney stones. 8. Does vitamin K contain potassium? No. The name vitamin K comes from the German word “Koagulationsvitamin,” and the potassium symbol K from the Latin “kalium.” The two “Ks” have nothing in common. 13 Responses to "Potassium (Kalium)"
What does 5.1 mean as my high level when the fruit ex: says 1 medium banana (425). How do I calculate it. I need to understand this. Joann, if your blood potassium level is 5.1 mmol/liter, it means it is high-normal, so still within the normal range. “1 medium banana (425)” is an estimated amount of potassium in an average banana, which means bananas are high in potassium. You can ask a doctor, if there is any concern about your blood potassium level and if you need to avoid foods high in potassium. If a doctor says yes, then you may need to limit eating bananas and other foods high in potassium (as listed above in the article in the Chart 2). You do not need to do any special calculations. Roger, you need to treat the causes – a doctor can tell what it is. Pt taking Potassium Chloride and HCTZ for high blood, patient consuming lots of bananas given by his wife that read that bananas consumption is necessary when taking HCTZ. Pt c/o of skipping heart beat and weakness. What is the possible cause for patient ‘s cardiac symptoms and weakness? What diuretic would be more effective? – Amiloride and spironolactone are potassium-sparing diuretics, so the patient would not need potassium chloride to prevent hypokalemia. What is a purpose of diuretic therapy? – The purpose is to decrease blood volume and thus blood pressure. I have fatty liver stage 3 and on labs potassium level was 5.4 is related to the liver what can I do because the diet for fatty liver is not good for high potasium . I’m not sure if fatty liver itself can cause high potassium levels. It is your doctor who can tell you the cause. In the Chart 3. above there is a list of foods low in potassium, but again, it is your doctor who can tell if a low-potassium diet is appropriate for you. Can a high potassium level affects creatinine? In kidney failure, both creatinine and potassium blood levels increase. I’m not aware that potassium would directly affect creatinine levels, though. I am a 40 year old healthy female and I have never had abnormal blood work. Well my routine blood work came back with my Potassium being 5.6 and my Hemoglobin Alc a 5.7. I am not over weight, I have a healthy heart and kidneys and I excercise and eat right. I am freaking out! How the heck do I lower this asap? It is a doctor who can explain these results and eventually order some additional investigation. So, I suggest you go back to the doctor and discuss this.